MEPs from the European Parliament’s International Trade Committee are in West Africa this week, to monitor the implementation of Economic Partnership Agreements. A team of six MEPs, headed by Bernd Lange (S&D group), will be in Ghana and Ivory Coast, meeting politicians, business leaders and civil society from Tuesday to Thursday, finishing with a press conference in the Ghanian capital Accra on the final day. However, the trip comes against a backdrop of mounting scepticism on the EPAs, with Angela Merkel’s Special Representative for Africa, Günther Nooke, last week calling them “no success story, neither for Africa nor for Europe”. Nooke is part of the German government team organising the upcoming G20 summit in Hamburg in June, the special focus of which is on Africa. He went on to say that he agreed with the sentiment that EPAs “are not an agreement, and it’s not a partnership” and said Africa-EU trade was currently “almost irrelevant”, except from coffee, cocoa and diamonds from Botswana. Although the EU is the world’s largest donor, both in absolute terms and to Africa in particular, the EPAs only date back to 2002. However, they had a troubled birth, with negotiations not finalised by 2008, as originally planned, and so temporary interim agreements have been made, first stretching to 2014, then extended to October 2016. The 16 heads of state of ECOWAS (the Economic Community of West African States) endorsed the EPAs in 2014 but the signature process is still in progress. Nigeria and Ghana have refused to sign up, while Ghana signed an interim EPA in August 2016 in order not to lose preferential access to EU markets. Under first the Lome Convention of the late 1970s, then the Cotonou Agreement of 2000 (which expires in 2020), all 79-members of the ACP (African, Caribbean and Pacific) nations, enjoy free access to the European market under the ‘Everything But Arms’ (EBA) criteria. According to a statement from the MEP committee, the visit this week “will focus mostly on the implementation process of recently concluded interim EPAs, regional integration of Western Africa and business and investment environment in those countries”. Lange’s team will meet with government, parliamentarians, the private sector and civil society and NGOs during the trip. 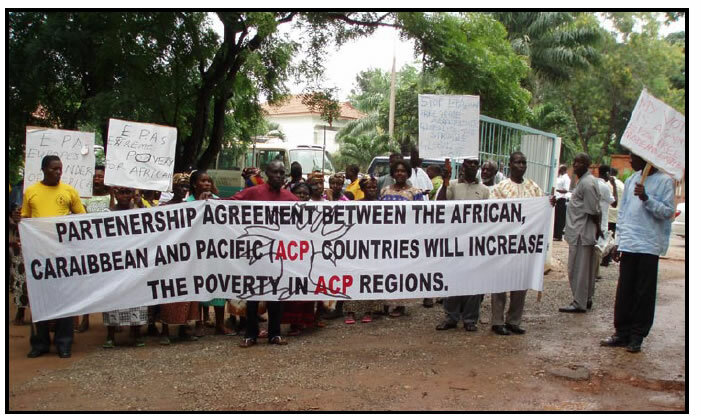 However, prior to departure, the committee posted a study on possible means of suspending EPAs with ACP states if they are deemed to break human rights, democratic principles or the rule of law, following the expiry of the Cotonou Agreement in three years time. Current progress on the post-Cotonou agreement appears to be sluggish, if not stalled, following talks in Dakar, Senegal last year. The 16 members of ECOWAS comprise Benin, Burkina Faso, Cape Verde, Ivory Coast, Gambia, Ghana, Guinea, Guinea Bissau, Liberia, Mali, Niger, Nigeria, Senegal, Sierra Leone and Togo. Both Sudan and Equitorial Guinea have refused to ratify even the 2000 Cotonou Agreement, after a 2005 amendment recognised the jurisdiction of the International Criminal Court. The current EU European Development Fund (EDF) of aid for ACP countries runs at €29.1bn, of which €24.3bn goes on national and regional cooperation programmes, €3.6bn on intra-ACP cooperation and €1.1bn on the ACP Investment Facility.